Hello all!! Welcome to our fourth challenge at Paper Therapy. Paper Therapy is an online forum for scrapbookers and card makers to share their work, meet new friends, learn new tips and techniques and have fun!! I hope you can join us every week in our challenges! The previous three have been SUPER fun and were seeing some really incredible designs! This week's challenge was to make a project based on only using scrap paper and ribbon that we had laying around. Luckily, I never throw my scraps out (including sticker sheets! ), so I had a lot to work with! YAY! I even had just enough lettering stickers to make a sentiment. I pulled out my current Hocus Pocus line from Pink Paislee. This line is originally designed as a Halloween line, but I decided to switch it around to make it a Thanksgiving card. I took some "Witching Hour" scraps and pleated the paper really tight. and let it dry, popping it up with foam dots. seam binding and bakers twine scraps. Patterned Paper: (Witching Hour, Hocus Pocus, Haunting, Good Fortune and Skeleton Soiree from Hocus Pocus collection) Pink Paislee. Pigment Ink: (Tuxedo Black, Copper) Tsukineko. Clear Stamps: (Pumpkin from All Hallow's Eve set) Inkadinkado. Fibers: (Brown seam binding) Prairie Bird Boutique . (Orange and white Baker's twine) May Arts. Accents: (Yellow, brown buttons) Creative Imaginations. (Tiny Type Alphabet stickers) Cosmo Cricket. (Green and white alphabet stickers) Jenni Bowlin. What a super cute and fun card! I love all the colors that you used for the Halloween feel! Love this! The colors are perfect and I love the buttons! Great card Emily! I love that you pleated the paper...and way to get more than one holiday out of a paper line! Awesome job! 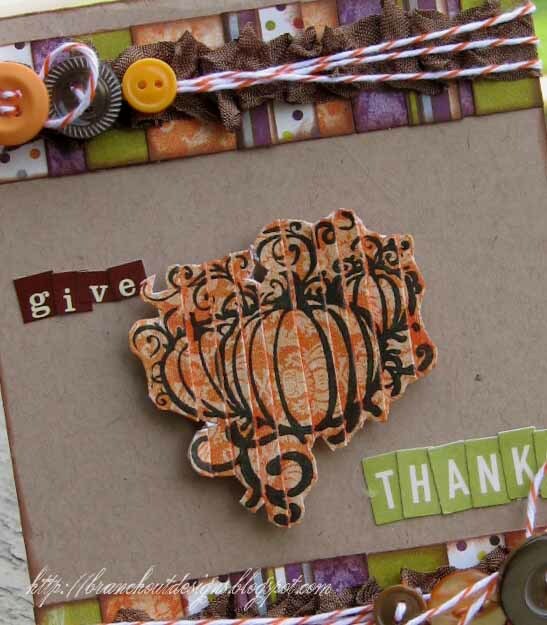 I love how you did the pumpkin and the scraps of paper along the bottom of the card! Awesome! WOW! This is awesome, Em! 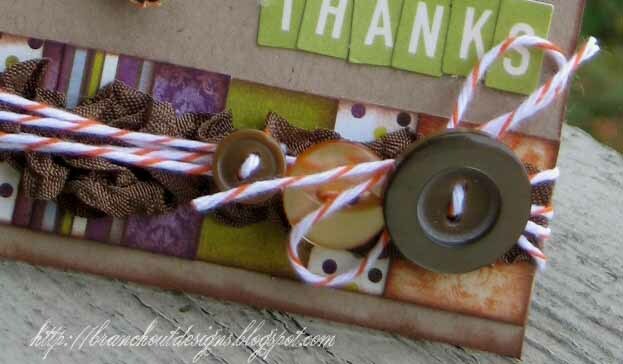 I LOVE, LOVE, LOVE how you stamped on the pleated paper and then cut out your image! Brilliant! i will have to give that technique a try soon! The pleating is SO COOL! I love the seam binding, the twine and the buttons, too. Awesome job!